Today I schlepped on down to the Carson City library with a couple of books I had to return. And after I dropped them in the bin, I wandered over to the Nevada section, as I usually do, to see if there was anything there that caught my eye. And indeed, when I was rifling through the shelves, I came across the book Remembrances of Centerville by Frieda Cordes Godecke from 1973. It’s a memoir of her time spent in the tiny little town of Centerville, a hundred years ago when it was actually a town and not just a bump in the middle of Hwy 88. And since the destruction of the Valley Bar was still fresh on my mind, I picked up the book to flip through the pages and see if the bar was mentioned at all. And indeed, right on the third page is a map of town, and the corner where the Valley Bar sat is marked “Saloon, later Cheese Factory”. I never knew there was such a thing as Centerville Cheese. I wonder if it was any good? 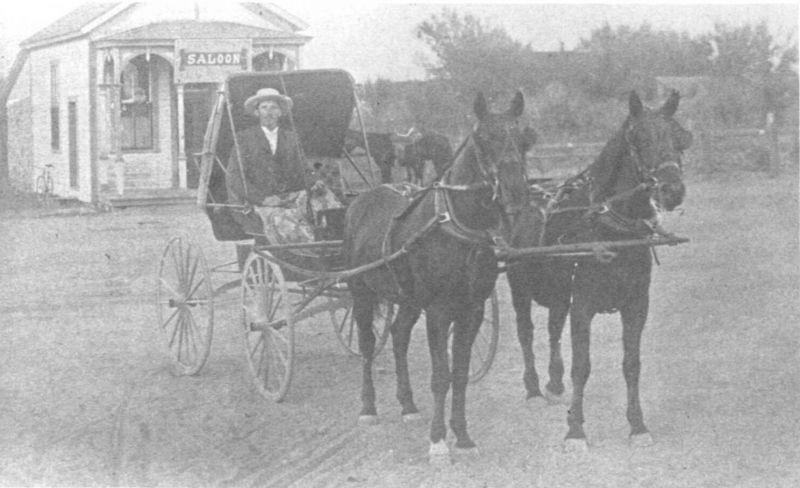 The caption says, “William Scheele in buggy in front of saloon. Cordes farm home in background.” The farm house where Frieda grew up is barely visible through the trees to the right, so that means that the building to the left was the town’s saloon (and later cheese shop, where Frieda says the cheese was quite good until the day they saw the cheesemaker letting his perspiration drip into the vat, after which they called it “Sweat Cheese”.) But there was something very familiar about the shape of that front porch; I realized I had just seen it yesterday. That saloon is the very same building that later, with a couple of additions, became the Valley Bar. That’s the same building that burned down on Sunday. I’m trying to figure out when that photo might have been taken, but there’s no date on the photo. In fact there are very few dates throughout the entire book (Frieda was born in 1900, and married in 1921, so presumably all the stories take place in those two decades.) There is a Herman Scheele mentioned as the driver of the valley milk wagon, but I haven’t found anything about William Scheele (other than a 1916 patent) or what year he might have been driving his buggy through town. 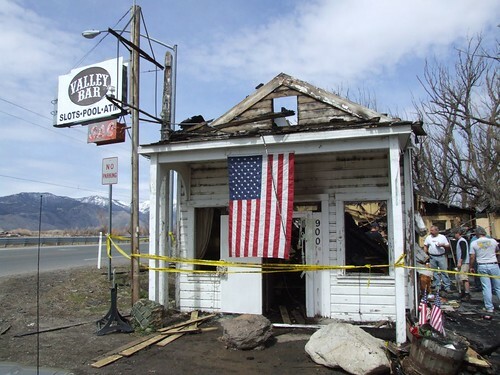 The Record Courier, in this article, mentions that the Valley Bar was “brought over from Virginia City in the early 1930s.” But the Valley Bar that we knew in the 21st century was much larger than the one in this picture. It looks like there had been two additions; one to the right, and one in the back. Was it one of those buildings that was brought down from VC and used to make the saloon bigger? Or is this a 30s-era photo? What’s left of the Centerville Saloon, the “Pride of the West”. The addition to the right was completely destroyed, leaving only this original facade. I guess it’s a moot point now. The bar has burned, and what’s left standing will probably be leveled soon. And so the story of yet another one of Nevada’s old buildings comes to an end. All I can do is put up these pictures, and try to keep it alive on the Web. Later: I found a couple more newspaper articles on the fire, this one from the Record Courier that gives a little more info about the fire’s cause (electrical) and the history of the bar, and a blurb in the Las Vegas Review Journal that says the original saloon building was “built in Virginia City sometime in the 1850s or 1860s” (which would make it survivor of the 1875 fire?) “and moved to Centerville by 1900.” That timeline makes a little more sense than saying it was moved in the 1930s. But it also says the cheese shop closed in 1902, which means Frieda would have been eating her “Sweat Cheese” at age 2. Her memory was pretty sharp, but I doubt it was that good.